Chances are your car is the second largest investment next to your home. Care for it properly and it will deliver the performance, lasting value and enjoyment you need and expect. A properly maintained car offers the greatest return on investment by performing safely and dependably for you and your family. Proper maintenance also helps you avoid more costly repairs down the road. J & R is able to make any repair on your vehicle; however we are firm believers in preventative maintenance rather than repairs. Preventative maintenance saves you money! Every time you visit our facility for a maintenance service (including oil change) we will perform visual inspections, check tire pressure, and all the vital fluids. Our service advisor will then make maintenance recommendations based on the condition of these fluids, the odometer reading, and the time interval since your last service. We’ll help you maintain a safe, reliable and cost effective vehicle. Every 3,000 Miles for most vehicles. We follow factory recommendations for scheduled maintenance, i.e. 30,000, 60,000 90,000 mile services. J&R Auto Repair Recommends replacing your vehicles belts and hoses at recommended intervals to prevent an unexpected breakdown. Belt failure can mean big trouble for today’s engines because serpentine belts are now used on most engines to drive the water pump, alternator, power steering pump, and air conditioning compressor. If the serpentine belt fails everything is lost and you could be stranded. A coolant hose failure can also mean big trouble, a failed coolant hose can result in an overheated engine which can cause severe engine damage. Let the certified technicians at J&R Auto Repair check your belts and hoses for you. It’s not easy to tell the true condition of a belt or hose by their outward appearance since most belts and hoses fail from the inside out. J&R Auto Repair understands that, and knows what to look for. J and R Auto Repair – Brake ServiceRegular brake inspections are the best way to ensure reliable and safe braking and minimize the cost of repairs when brake service is needed. J&R Auto Repair performs free brake inspections every time we rotate or replace your vehicles tires. Our service advisor will let you know if adjustments or repairs are necessary and approximately how much life is left before repairs will be needed. Because brakes are a normal wear item for any car, eventually they’re going to need to be replaced for both performance and safety reasons. We also check the condition of the brake fluid and recommend periodic flushing and filling. Dirty brake fluid can cause erosion and other problems with your vehicles brake system. J&R Auto Repair recommends rotating the tires and having your brakes inspected every third oil change or approximately every 9,000 miles for most vehicles or refer to your owners manual for the manufacture’s recommendations. J and R Auto Repair – Tune Up ServiceA properly tuned engine delivers the best balance of power and fuel economy and produces the lowest level of emissions. Modern engines compensate for worn parts to a degree, giving you the sense that everything is fine with your car. A routine tune-up will restore your car to its normal operating state, and contribute to the overall efficiency of the engine and emissions system. Your service advisor at J&R Auto Repair may recommend a tune-up based on mileage intervals (refer to your owner manual for your vehicle) and the condition of your engines ignition parts. Routine tune-ups and engine performance checks can be your best assurance of good performance and fuel economy. And a healthy running engine will also maximize the life of expensive emission system components. J and R Auto Repair – Tire ServiceYour vehicle’s tires affect its ride, handling, traction and safety. Tires are the critical connection between your car and the road in all sorts of driving conditions. To maximize your vehicle’s tire life, and your safety, J&R Auto Repair checks your vehicle’s tire condition and inflation pressure every time you bring your vehicle in for an oil change service. For your safety our service advisor will recommend replacing tires if the tread depth is at or below the minimum requirement, or the sidewalls are severely cracked or punctured and in rare cases when a tread puncture cannot be repaired. J&R Auto Repair recommends rotating the tires and having your brakes inspected every third oil change or approximately every 9,000 miles for most vehicles or refer to your owners manual for the manufacture’s recommendations. Rotation time also serves as a good opportunity to have us balance your vehicles tires. Unbalanced wheels can cause pre-mature failure of shock absorbers and struts, and wheel balance can change as a result of normal tire wear. If your vehicle has a hard time getting around on the slippery Minnesota roads in the winter, you may want to consider winter tires especially if your vehicle has wide or low profile tires. Let your service advisor at J&R Auto Repair suggest a tire size that will put the law of physics on your side. Larger or wider tires meet more resistance because they have to “plow” a wider path through snow. We’ll help you select narrower tires with a more aggressive tread to help you get around safely this winter. J and R Auto Repair – Engine Light ReportsA “Check Engine” or “Service Engine soon” light became standard on the instrument panels of all car makes and models in 1986. An illuminated light indicates that a problem with your car’s engine, emission, or power control systems has been detected by your car’s on-board diagnostic system (OBD). A flashing light indicates a problem that is currently happening and may require immediate attention, whereas a steady light can be diagnosed at the first convenient opportunity. J&R Auto Repair uses today’s latest automotive technologies and are equipped to diagnose the problem on both domestic and foreign cars as well as light trucks. J and R Auto Repair – AC/Air Conditioning ServiceToday’s automotive air conditioning or ‘A/C ‘ systems are ever changing with the advancements of new refrigerants and system designs. Our staff at J&R Auto Repair receives frequent air conditioning system training to make sure that we stay ahead of the latest air conditioning technologies. Since today’s A/C system capacities have gotten much smaller it’s very important that you stay on top of regular air conditioning system check-ups. Having your car’s A/C system serviced regularly can help save you money on more expensive repairs. A small air conditioning system leak not only results in the loss of refrigerant but also the loss of important lubricants that are necessary to keep the A/C compressor properly lubricated. A loss of these lubricants will lead to expensive A/C compressor failure. Unfortunately, when an A/C compressor fails, it’s common that the entire air conditioning system can become contaminated with debris, such as metal, as a result of the A/C compressor failure. When repairing an air conditioning system that has been contaminated, it’s necessary to remove ALL of the debris from the A/C system to ensure the replacement compressor will not be compromised due to debris moving through the other parts in the A/C system. This can only be done by replacing all the air conditioning components that are “non-flushable”. Since A/C systems that are leaking and are low on refrigerant can still run and cool your cars interior J&R Auto Repair recommends a thorough inspection of your car’s heating, ventilating and air conditioning system (HVAC) annually to save you money in the long run. Your vehicle air conditioning system keeps your vehicle’ interior comfortable in any season by providing the right temperature and humidity level. The A/C system also helps keep you safe by improving defroster operation in the winter. J and R Auto Repair – Cooling System ServiceIf you notice that your car’s engine is running warmer than it used to, a sweet smell, leaks, or you repeatedly have to add coolant to your cars reservoir, it’s time to take your car to J&R. The technicians at J&R Auto repair are cooling system experts. The engine cooling system affects your cars overall dependability and engine longevity. Cooling systems have advanced over the years with new coolant formulations and new radiator designs and materials, but it’s still important that proper cooling system maintenance is performed. If you suspect a problem with your cooling system, you should have it checked immediately. Neglected cooling systems can lead to engine and automatic transmission damage. J and R Auto Repair – Exhaust ServiceJ&R Auto Repair can help you maintain a safe vehicle by performing regular exhaust inspections. Free visual exhaust inspections are done every time J&R performs your vehicle’s oil change service. The exhaust system routes dangerous exhaust gas from the engine out and away from the car to keep from affecting your safety. Exhaust systems have come a long way since the old days of exhaust pipes and a muffler. Today, the exhaust system is a safety and emission system rolled into one. Yes, we still have exhaust pipes and mufflers but we now also have catalytic converters to reduce the amount of harmful pollutants; and oxygen sensors in the exhaust system to monitor the level of oxygen in the exhaust gases to maintain efficient engine operation and to monitor the catalytic converter’s operation. Driving habits, especially short trips, can take a toll on an exhaust system’s life by not allowing the exhaust system to get hot enough to let the condensation evaporate from the muffler. So does our Minnesota winters, with the road chemicals for ice and the bumpy roads that emerge from all of our potholes. If you notice that your vehicle has started to get louder, drowsiness while driving, or a rattling noise when starting, accelerating or braking, it’s a good idea to take your car to J&R for an exhaust system inspection; these are signs that your vehicle may have an exhaust system problem. If you prefer to drop your vehicle off early in the morning or late at night, our after hours key drop is there for your convenience. If your vehicle needs to be towed to one of our locations, call the reputable people at ASAP Towing and tell them to “Take your car to J&R”. They know their way here and they’re local. 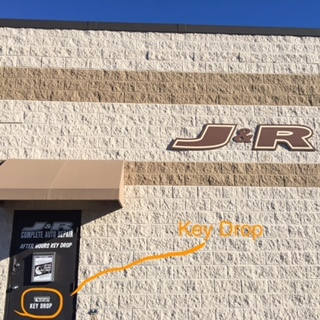 © 2019 Copyright J&R Complete Auto Repair – My Mechanic Shop. All Rights Reserved.